I’ve long been a fan of the American Space Program – in some senses we grew up together. Like many other youngsters I built scale models of various space craft, from fact and fiction. 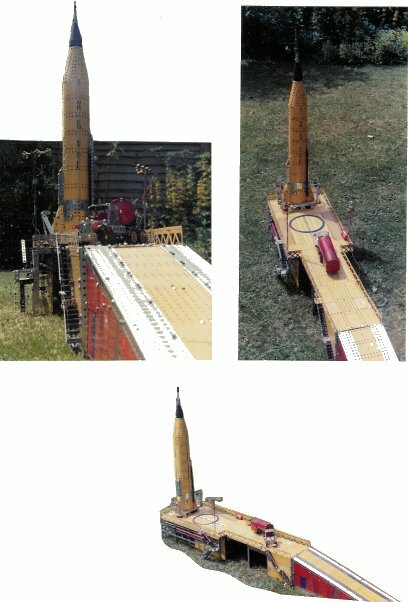 One of them was Revell‘s old kit of the Mercury Atlas launch complex, and that inspired me some thirty years ago (when I had less Meccano and less grey hair, too!) to build my own version in Meccano. Now, fifty years since John Glenn was the first American Astronaut to orbit the earth I have begun to tackle this subject again: the new version is to the same scale, but it is bigger in many ways and certainly more detailed, but looking back I remain pleased with the result, a tribute to the “Magnificent Seven”, the astronauts who rode first the Redstone and then the Atlas boosters into orbit in their tiny one-man space-craft. As to the current model – as they say, watch this space! This entry was posted in Space and tagged Atlas, John Glenn, Magnificent Seven, Meccano, Mercury, Mercury Atlas, NASA, Philip Webb, Redstone, Revell, rocket, space program, Spacecraft. Bookmark the permalink.